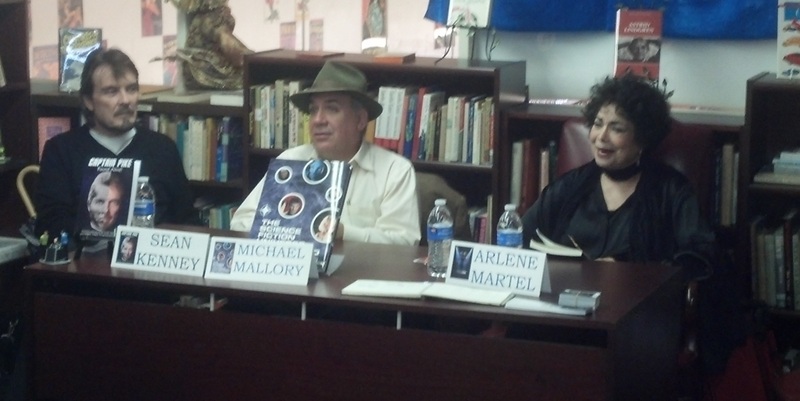 Sean Kenney, Michael Mallory and Arlene Martel at Myster & Imagination Books. By John King Tarpinian: Sunday afternoon, December 2, there was a mini Star Trek/Twilight Zone/Outer Limits/SyFy Channel book signing and talk. (Whew) Science Fiction Historian Michael Mallory who has a new book, The Science Fiction Universe and Beyond, played host to Sean Kenney, Captain Pike: Found Alive!, and Arlene Martel, Mixed Messages. Sean Kenney is best known as having played Captain Pike, in the wheelchair, in the Star Trek “Menagerie” two part episode. Sean was very personable and entertaining. Best known as Captain Pike he also was part of the original command crew…eventually replaced by Walter Koenig because the studio wanted a Davey Jones type character. He went on to say that was lucky for him as he was never type-cast as many of the actors became. One bit of interesting trivia was that when doing the makeup for Captain Pike they were having trouble with the appliances staying on. To solve the problem the assistant makeup man cut out a piece from his blue jeans and that is what is on Captain Pike’s face. If you want to feel old, Sean was 24 when he was in “The Menagerie” which was 46 years ago. This week Sean will be 70 years old. Arlene, best known as Spock’s betrothed, talked about her career. She knew and was friends with such icons as James Dean and Marlon Brando. Arlene has one of the most classic lines in any Twilight Zone when she utters, “Room for one more, Honey.” My favorite Outer Limits was written by Harlan Ellison, “Demon with a Glass Hand,” where she played Consuela opposite Robert Culp. Michael Mallory has his hands in many pots. He writes mysteries, is an expert in pop culture and animation. He can write from the perspective Sherlock Holmes’s Doctor Watson’s second wife (try to follow that logic) to X-men and the Marvel universe. Then there is his acting career and writer for the likes of William Shatner when he hosts award shows. Michael has hosted the Annie Awards which are the Oscars of animation. Even with the day having something we in Southern California call rain that most the rest of the country calls drizzle there was a nice attendance with good questions being asked of the panel with equally good answers. This entry was posted in Like Show Business and tagged Arlene Martel, Michael Mallory, Star Trek by Mike Glyer. Bookmark the permalink.